The cockatiel, the smallest species of cockatoo, makes an excellent pet choice. 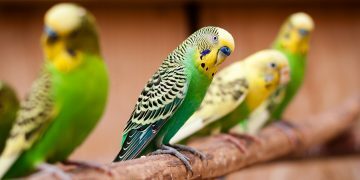 They have a long history of domestication, display a docile and quiet nature, and are resistant to many of the viruses that afflict larger species of talking bird, like the parrot. Native to Australia, the cockatiel was first bred in captivity shortly after the species was first identified by naturalist Robert Kerr in 1792. Its scientific name is Nymphicus hollandicus, drawn from the bird’s original connections with mythical nymphs (thanks to their beauty) and their Australian origins; the word hollandicus refers to Australia’s historical name, New Holland. Size: A typical pet-quality cockatiel is about 12 to 14 inches in length; show-quality birds are 1 to 2 inches larger. Their weight ranges from about 3½ to 5½ ounces. Plumage: The common domesticated cockatiel has gray feathers with a yellow chest crest and white patches on both wings. Males have white or yellow faces; females have gray or light gray faces. Both sexes also have orange cheek patches, which are brighter and richer in males and more subdued in females. Song/Chirp: The song of the cockatiel is an important part of the bird’s behavior and socialization, and ranges from a few shrill notes to complex musical phrases. Melodic and rhythmic, the songs of cockatiel birds are used by males in mating rituals and to establish dominance in the pecking order. Other common cockatiel sounds include mimicry, both of human voices and of environmental noises. 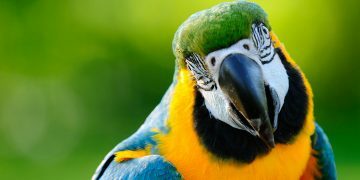 However, these birds don’t display the range or depth of human mimicry demonstrated by the parrot or myna bird. Cockatiel breeding experts note that these birds are among the gentlest domesticated birds in the world and are well-known for their sweet, social dispositions. Proper cockatiel care should include natural branches as part of the cage furniture, as these birds love to pick at and peel the bark off of wood. Good cockatiel cages also include perches of varying diameters, which help stretch the bird’s feet properly. Being intelligent, cockatiels also love to play with bird toys. Investing in a selection of playthings will help keep your pet happy and can prevent the development of problematic behavioral tendencies. Feeding: Seeds, cuttlebone, millet, and fresh fruits and vegetables should all be incorporated into the diet of a cockatiel. Choose a bird food brand with the input of a veterinarian or bird expert. Grooming: Like most other domesticated birds, cockatiels will look after most of their grooming needs on their own. Provide a birdbath with clean water, and trim the nails occasionally. Little else should be needed, other than perhaps an annual clipping of the wing feathers. Health Concerns: Cockatiel birds need regular screening for chlamydiosis, a type of respiratory infection. 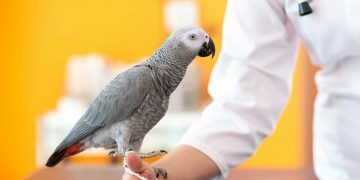 Bear in mind that this illness can be transmitted to humans as well, so exercise care when handling a bird you suspect may be ill. Also, take care not to let cockatiels stretch their wings in your kitchen, as kitchens contain all sorts of potential hazards for birds. Life Expectancy: The average life expectancy of a healthy, well-fed and regularly exercised cockatiel is 15 to 20 years. Breeding cockatiels is a well-established science, and you should look for a bright-eyed bird with smooth plumage and good posture on its perch. Pet stores with cockatiels for sale generally charge between $20 and $100 for a bird. Also, bear in mind that cockatiel training is made much easier if you choose a baby bird that’s been hand-fed and socialized with humans from the time of its birth.